Theme Plaza – Get custom themes for your 3DS Home Menu. Also find custom badges and splash screens for CFW. 3DS Theme Swap – Request and submit custom themes in this subreddit. Includes links to many themes. GBATemp Custom Theme Thread – Discussion thread where you can find and post your own custom themes and compilations. Caution: 3DStheme.com is not a legit site. Do not visit it to download themes. It is a survey site where in order to download anything you must complete offers and it does not work. Once you’ve downloaded some you like follow the next section to install them on your 3DS. Ensure you’ve installed the Homebrew Launcher on your 3DS before attempting to follow this tutorial. On your computer, open up the main directory of your 3DS’ SD Card. Go into the “Themes” folder. This is where you will place the themes you’ve downloaded. 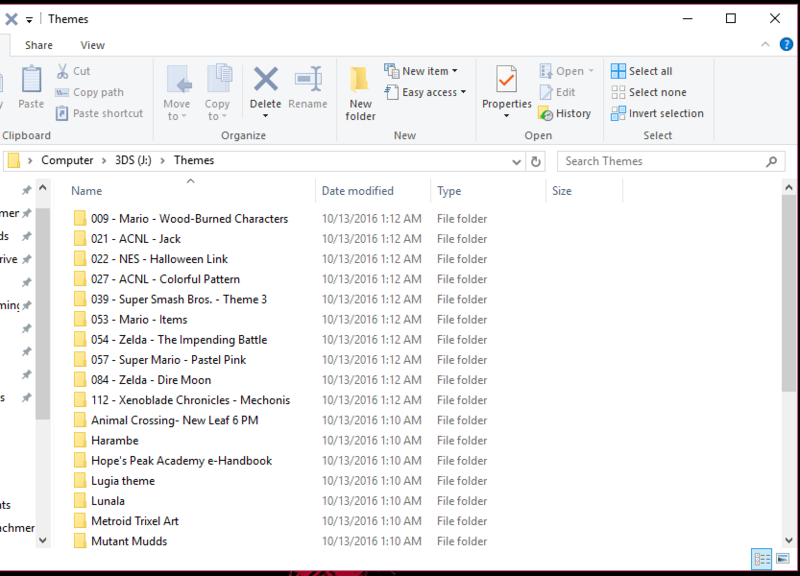 Locate where you saved your 3DS themes. Each theme and its files will get its own folder within the “Themes” folder. Transfer all of your themes to your 3DS Themes folder as shown below. Download the latest version of Anemone3DS CIA or 3DSX. For .CIA (recommended) place it anywhere on the SD and install using FBI. If you installed the CIA, you’re done. Launch the app on your 3DS. For 3DSX users only: Place your microSD/SD Card into your 3DS, power it on, and launch the Homebrew Launcher. For 3DSX users only: In the Homebrew Launcher, navigate to Anemone3DS and start the application. Select a theme or themes and install. Press START to exit the app. Congratulations, you should be able to see your custom theme! Note: You can download themes via the QR code function on Theme Plaza. Anemone 3DS supports downloading themes via QR code. Want to make your own theme? Read on to the next section. If you want to make your own theme to customize your menu specifically to your liking follow this guide. Essentially you will be using a template to edit the top and bottom screen with a program that can read .psd files (eg. Photoshop), adding custom music, folders, and extra effects to compile your theme files. The process can be time consuming but the end result will be worth it. I’ve spent some time looking through a lot of themes and narrowed down my top 10 personal favorites. I’ve divided them between top 10 official themes and top 10 custom themes. Check out my top 20 themes post here.